Our series of Rubber/Gelatin print lifters are available in 3 different sizes with white, black, or transparent adhesive rubber backing cards and crystal clear mylar cover sheets. To lift a print, peel back the clear mylar cover, press the gelatin surface of the rubber backing card on the developed print, lift the print, and then replace the mylar cover. 3M Poly Tape, 1.5" x 125"
Hinged Print Lifters - Back-Up 2"x4"
Hinged Print Lifters - Back-Up 6"x9"
Rubber/Gelatin Hinged Latent Print Lifters - Black - 2"x2" 12/pkg. Lifters - Black - 12/pkg. 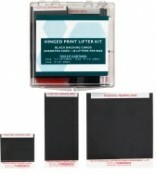 Rubber/Gelatin Hinged Latent Print Lifters - Black - 2"x4" 12/pkg. Rubber/Gelatin Hinged Latent Print Lifters - Black - 4"x4" 12/pkg. 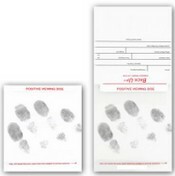 Rubber/Gelatin Hinged Latent Print Lifters - Transparent - 2"x2" 12/pkg. Lifters - Transparent - 12/pkg. 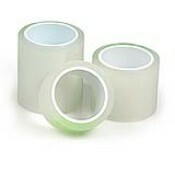 Rubber/Gelatin Hinged Latent Print Lifters - Transparent - 2"x4" 12/pkg. 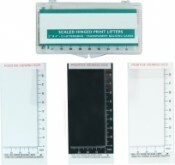 Rubber/Gelatin Hinged Latent Print Lifters - Transparent - 4"x4" 12/pkg. 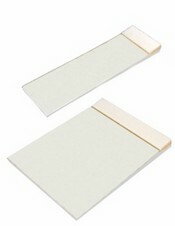 Rubber/Gelatin Hinged Latent Print Lifters - White - 2"x2" 12/pkg. Lifters - White - 12/pkg. 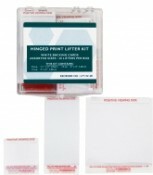 Rubber/Gelatin Hinged Latent Print Lifters - White - 2"x4" 12/pkg. 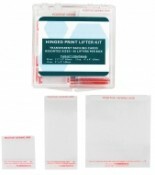 Rubber/Gelatin Hinged Latent Print Lifters - White - 4"x4" 12/pkg. 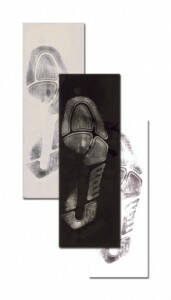 Black Hinged Footprint Residue Lifter 6"x15"
Transparent Hinged Footprint Residue Lifter, 6"x15"
White Hinged Footprint Residue Lifter 6"x15"
Black Rubber/Gelatin Footprint Lifter - 5"x14" 2/pkg. Transparent Rubber/Gelatin Footprint Lifter - 5"x14" 2/pkg.